Dhaka, Sep 11 (Just News): Supreme Court Bar Association (SCBA) today requested Law Minister Anisul Huq to withdraw his comment on the lawyers of BNP Chairperson Begum Khaleda Zia over her jail trial. SCBA President Joynul Abedin said the comment of the minister, where he said that Khaleda’s lawyers do not know the law, is “insulting for the lawyers of the country”. The law minister’s comments were made last week when Khaleda’s lawyers complained to the chief justice saying that the law ministry has issued a gazette notification illegally for shifting the court to Dhaka old central jail for holding trial of Zia Charitable Trust graft case. He said, many lawyers lost memberships of the SCBA by making such derogatory comment. 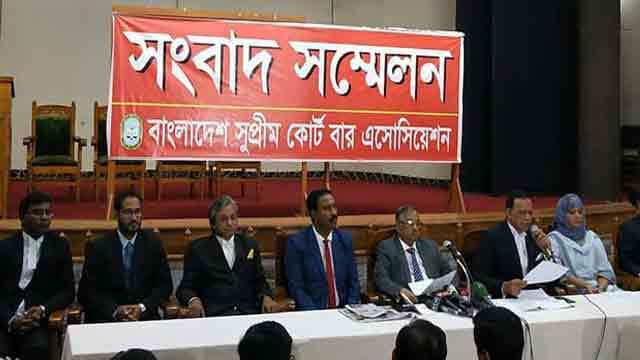 SCBA secretary Barrister AM Mahbub Uddin Khokon also spoke at the press conference. Khaleda's lawyers on Sunday applied to the office of Chief Justice Syed Mahmud Hossain, requesting him to launch “enquiries” and take appropriate actions against the judicial officers “encroaching their legal boundaries at the instruction of the government”.